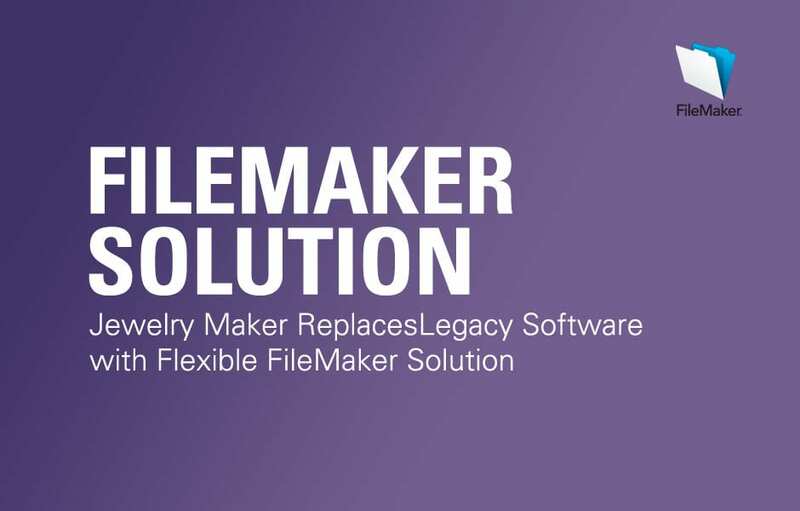 Jewelry Maker Replaces Legacy Software with Flexible FileMaker Solution has had to evolve and adapt to some dramatic shifts in the business climate over its 30+ years of existence. Starting out as a wholesaler back in 1981, it morphed into a manufacturing operation for some time before settling into its current main focus as an importer. The Elkins Park, PA, company now procures its entire product line from Asia to a Rhode Island facility for distribution and shipping. Changes in the business demanded frequent changes to the ways in which data were managed, so early on the company chose a database platform that could (1) work in a primarily Macintosh environment and (2) be easily customizable to keep up with changing processes and workflow. This original system stayed in place for almost 20 years, a remarkable track record given how the typical lifespan for such systems is between 5 and 10 years. •The project would amount to close to one year of work for the chosen vendor. But because cutover from the previous system would have to be handled as a fully deployed application, the project couldn’t be segmented into phases and introduced gradually into the company. •The existing solution was fairly unique in that it was keyboard-centric, so that the primary users of the system could do “heads-down” data entry without looking at the screen. Thus the system would have to be designed accordingly. •Despite the knowledge that the end was inevitable for the previous system, learning a whole new platform and having trust that it would be available for the long haul was a viable concern that had to be overcome. •The company’s accounting software, QuickBooks, would continue to be used. Integrating with it was preferred to replacing it. Return By choosing IT Solutions to design and develop its business management software on the highly flexible FileMaker platform, Rainbow expects to remain competitive through many more changes in the business climate in the years, or possibly decades, ahead. Like most successful businesses, costume jewelry importer Rainbow Sales has had to evolve and adapt to some dramatic shifts in the business climate over its 30+ years of existence. Starting out as a wholesaler back in 1981, it morphed into a manufacturing operation for some time before settling into its current main focus as an importer. The Elkins Park, PA, company now procures its entire product line from Asia to a Rhode Island facility for distribution and shipping. Changes in the business demanded frequent changes to the ways in which data were managed, so early on the company chose a database platform that could (1) work in a primarily Macintosh environment and (2) be easily customizable to keep up with changing processes and workflow. This original system stayed in place for almost 20 years, a remarkable track record given how the typical lifespan for such systems is between 5 and 10 years.